1. Create a customizable wall hanging that speaks to your home's aesthetic and also offers extra storage. 2. Bring some character to the bedroom by mounting a pegboard above the bed and assembling a dynamic collage of prints and objects. 4. A small, freestanding pegboard is a great option for mobile storage — and an especially appealing option for the office. 5. 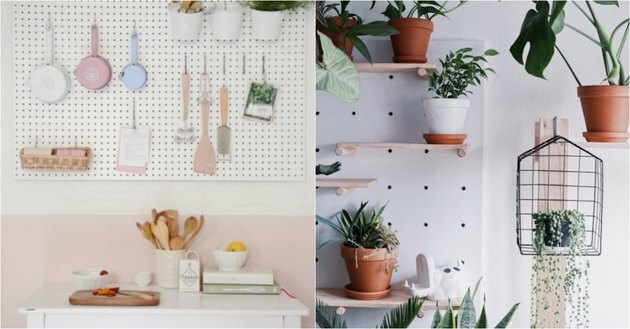 Of course, a pegboard in the kitchen is a classic way to organize pots and utensils. Adding little cups and baskets allows for storage of non-hangable items. 6. 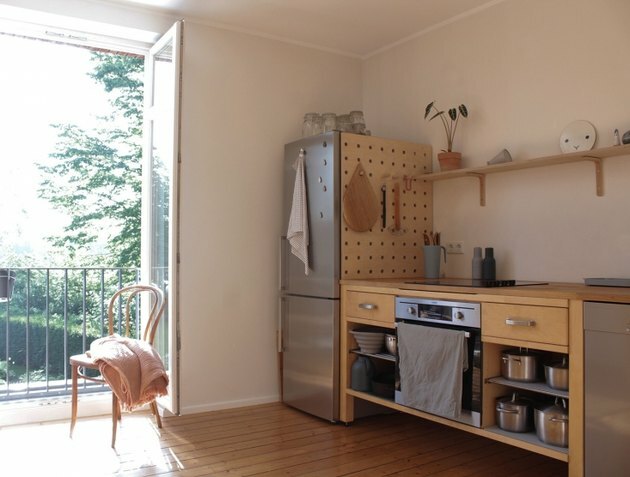 Or you could really go all out and outfit your kitchen with a pegboard backsplash, giving you new shelving options. 7. Small kitchen bonus: Make use of dead space on the side of the fridge. 8. Small entryway? Add a setup like this to your hall, and you'll have a storage spot that eliminates the need for furniture. 9. If you ask us, installing a pegboard in a cabinet is a pretty genius way to store jewelry. 10. A pegboard is exceptionally handy in a kid's room, as you can change up the position of pegs and shelves to accommodate ever-changing needs. 11. How to make a gallery wall without nailing a million tiny holes in your wall? Problem solved. 12. Truth be told: This is one of the most appealing bike storage situations we've seen. 13. Make a craft or hobby space ultra-organized with a spot for every specific item. 14. Make a living room feel like a greenhouse by creating a plant-heavy collection — which is particularly useful for new apartment dwellers who are lacking in decor options.